Notary signing agents never know what to expect when arriving at a signing. We regularly deal with widely varying moods, personalities and demeanors of signers. Over the years, I’ve learned how flexibility, a positive attitude and good communication skills can greatly affect the psychology of the signing table. The talkative signer: Someone who won’t focus on the closing or anything you point out because they want to talk, and talk, and talk. 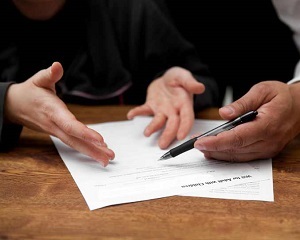 The nervous signer: A person, or couple, who is unsure and nervous about the signing process. Maybe they are buying their first home, refinancing for the first time, or simply unfamiliar and overwhelmed with the amount of paperwork. The rude signer: It doesn’t matter what you do, this person is just not nice. The reader: This person insists on reading every line in every document. One time, I had a “reader” who used a magnifying glass to make sure he didn’t miss anything. Needless to say the signing took a very long time to complete. The frustrated signer: Someone who is fed up because they do not believe they have received enough communication and information during the borrowing process, so they take out their frustrations on you. It really helps to just go with the flow and adjust to the signer’s expectations as needed. Sometimes signers want to sign very quickly and be done. Other times you walk into a disaster that takes 2+ hours. Or maybe you show up to a scheduled signing and they are just finishing up dinner and still clearing things off the table. In this busy, crazy industry, being rigid and inflexible is a recipe for failure. Being flexible and adapting to the signer’s needs and expectations will help keep everyone happy and make your life a lot easier. A positive attitude is essential, no matter how bad things get. If you respond in kind to a testy or angry signer, it will only make matters worse. If you stay positive and professional, that will help defuse any tension. Signers will pick up on your demeanor so it’s best to be upbeat and pleasant because this will help lift everyone’s attitude and, hopefully, make the signing more pleasant. Good communication goes a long way toward preventing problem. Always call the signer to confirm your appointment and introduce yourself. If you’re running late, be sure to call the signer, let them know, and apologize for the delay; most likely they will be understanding and appreciate your call. Honest timely communication with the signer will help ensure the signing goes smoothly. Signers may yell at you, ask you personal questions, or have their pets jump all over you, but you must do your best to keep focused on the job at hand to ensure the signing is completed accurately. As Notaries, we meet all types of people and handle many situations. Whether you are handling a loan closing or a general Notary job, keep in mind that most people don’t deal with legal documents on a daily basis. It’s our job to make the signer feel comfortable and confident in our ability to get their documents signed and notarized properly. Amanda Doumanian Reeves has worked as a mobile Notary in Tallahassee, Florida, for five years and helps run a thriving business, A Notary on the Go, with her family. I once did a signing with a Chinese couple, They read just about every document and then discussed it among them selves in Chinese. I was there for over 3 hours before the signing was done! Another type is the individual that want to control the signing. It would be nice to have a book that describe each person and tips on how to handle them. The classification of the "reader" signer is unfair. In a home purchase years ago, I was a "reader" and determined our family income was grossly overstated. I insisted that the documents be re-drawn. The loan officer/notary told me to sign - I refused - and the signing was delayed 24 hours to correct many of the documents. This article implies I should not have read those documents. As a notary of 30 plus years - I am surprised that another notary would not respect the right of the signer to know what they are signing! I have been both an escrow officer and now a certified signing agent. We obviously don't know what is going to happen in our signings. So, once I notice someone wants to read "everything" I ask the Escrow Officer or Agent, if there is time for the signer to take their copies of their documents and read them, and then re-schedule their appointment. To the lenders, if you have an antsy buyer/borrower, offer to send their copies to them to read in advance. We should all work together. I like animals I always speak to the pet as welcoming committee If come at me, let them smell , most of the time the go off and are fine. People usually put out or in another room. The pets are important to people. It will often break the ice and they are ready tto accept you. I closed loans in semi's, on trunk of a car. In my car, in a garage of unfinished house, a swell house and a few I would rather not be there or ever again.The smell, espcially when in the sub prime period. But I have found most are very nice and thank me for coming only once I was told to get out and that was a debt settlement assignment. Good article. You will see all of these types of signers and more. I especially like Paul K's suggestion that Lenders try to anticipate those who wish to scrutinize every detail and get the docs to them ahead of time for their review. My sister-in-law (who is a reader) insists on this, and it benefits everyone. This is my absolute favorite article. And my absolute favorite part of this job. I actually love the signings that go haywire because it's such a wonderful feeling when you can be the one that stays centered and brings everyone in to calmness and alignment. And you get it handled. To me it's the greatest challenge and the most wonderful gift of this job. It's really strengthened my ability to stay centered, not get defensive or take things personally, bring folks out of their emotional minds and into their rational minds by using open ended questions, and remain calm. Then move into problem solving. It's not always easy. But it so rewarding!